We can host your group in a variety of spaces within Madigan's - our PARTY PLANNERS WILL WORK WITH YOU ON PLANNING THE PREFECT GET-TOGETHER. Looking for a venue for your Christmas Party. Madigan's O'Connell Street offers you a spacious room with a Private Bar. 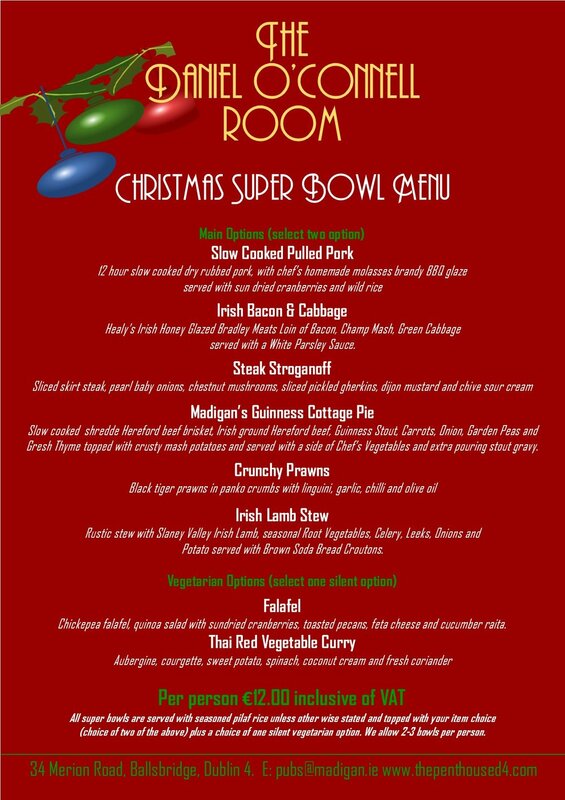 Choose from a Supper Bowl Christmas Menu or a Finger Food Christmas Menu. If you require something a little different our Madigan's Catering Chef will be happy to create a bespoke Christmas menu for you! Our Team in Madigan's will work with you to help you create an evening to remember!